President Donald Trump has inspected several proposed models for a border wall to separate the United States and Mexico. 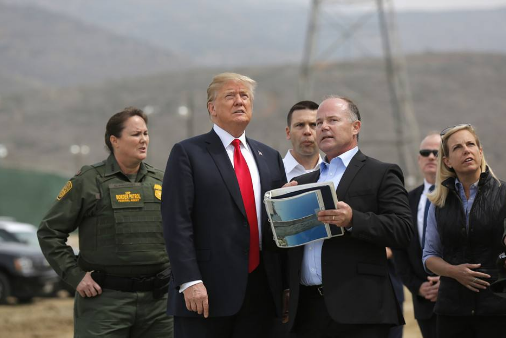 Trump went to the border site Tuesday, just after landing in San Diego. It is his first visit as president to the state of California. There are eight border wall designs. Trump said he favored a fully concrete wall because it was the hardest to climb. However, he also noted part of the wall should be transparent. Trump said he noticed the repaired holes in some parts of the existing fence at the border. He described the existing wall as "lousy" but noted it stopped as much as 95 percent of attempted illegal entry. Activists for and against the president's plan demonstrated near the site. The Trump administration is currently battling with California about its refusal to help federal agents detain undocumented immigrants in the United States. The president said Tuesday that the state's sanctuary policies ''put the entire nation at risk.'' Last week, the U.S. Justice Department took legal action against California over three state immigration laws. Trump said the laws were the best friend of the criminal. ''The criminals take refuge in these sanctuary cities and it's very dangerous for our police and enforcement folks,'' he said. While in California, Trump is also expected to speak to Marines in San Diego. He will also attend a fundraiser in Los Angeles, where he will stay overnight. Demonstrations were held at the San Ysidro port of entry in San Diego, the nation's busiest border crossing, where protesters chanted, ''No ban! No wall!'' Protests were also held on the Mexican side, in Tijuana. At San Ysidro, 21-year-old Jose Gonzalez expressed his displeasure with Trump's policy. ''I don't think it's really fair how he has the choice to separate us,'' he said. Gonzalez holds Mexican and U.S. citizenship. He crosses the border from Mexico daily to work at a San Diego restaurant. However, 48-year-old Army veteran Mark Prieto criticized the protesters. ''I think he is doing a lot of good, like protecting our Border Patrol,'' she said. He lost a lot of money in gambling. He never mentioned the border wall. They discussed the drug war in Mexico, illegal immigration and the world recession. He assigned federal agents to listen in on Martin Luther King's phone calls. 5.He described the existing wall as "lousy" but noted it stopped as much as 95 percent of attempted illegal entry. I enjoy pleasure as much as the next person. 6.Last week, the U.S. Justice Department took legal action against California over three state immigration laws.